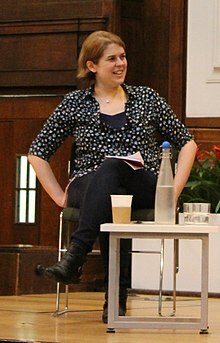 Helen Lewis (born 1983) is a British journalist and the deputy editor of the New Statesman. She has also written for The Guardian and The Sunday Times. Lewis was educated at the independent St Mary's School, Worcester and went on to read English at St Peter's College, Oxford. After graduating, she gained a Post-Graduate Diploma in Newspaper Journalism from London's City University. Subsequently, she was accepted on the Daily Mail's programme for trainee sub-editors, working in the job for a few years, and later joining the team responsible for commissioning features for the newspaper. For five years from August 2006, Lewis ran a networking event, open to all young journalists, called Schmooze and Booze, for which she organised events held in a Central London pub every other month. Lewis commented in 2007 that older colleagues, who had worked with each other for quite a long time, all seemed to know each other, while her contemporaries did not. Lewis was appointed as Deputy Editor of the New Statesman in May 2012, after becoming Assistant Editor in 2010. In 2012, Lewis coined the light-hearted Lewis's Law: "the comments on any article about feminism justify feminism". Lewis's book Difficult Women, a history of modern feminism, is due to be published by Jonathan Cape in 2020. She is married to the journalist Jonathan Haynes. ^ "St Marys Worcester – Home". stmarys.org.uk. ^ Lewis, Helen (9 August 2012). "@helenlewis". Twitter. Archived from the original on 3 December 2013. Retrieved 29 March 2013. As I've just told @alicetiara, the comments on any article about feminism justify feminism. That is Lewis's Law. ^ Cowdrey, Katherine. "Cape to publish 'battle cry for difficult women'". The Bookseller. Retrieved 12 January 2019. ^ Urwin, Rosamund (10 August 2015). "Boxing clever: why everyone from Gigi Hadid to Ellie Goulding is toning up in the ring". London Evening Standard. Archived from the original on 21 August 2016. Retrieved 16 July 2016.